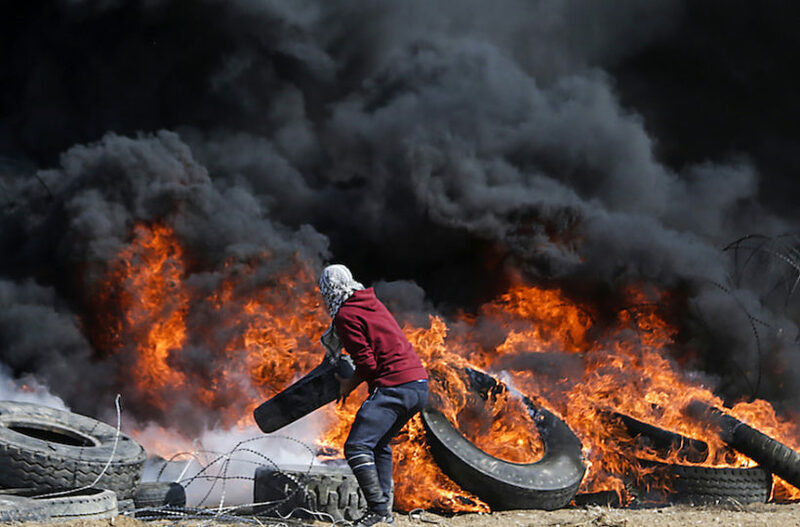 (by Simon Plosker, HonestReporting, May 15) – Following scenes of violence at the Gaza border on Monday, Israel now stands accused by its critics of various crimes against the Palestinian people. Who benefits from the images of dead and injured Palestinians? There is only one winner in this situation and Israelis are certainly not celebrating the bloodshed. The images of Israelis celebrating the US Embassy move at the same time, however, create a false image of Israeli insensitivity. For the Hamas terrorist organization, it was always likely to be a win-win situation. Succeed in overwhelming Israeli military forces by breaching the Gaza security fence enabling Palestinian terrorists to carry out attacks against Israelis is a win. Failing that, scenes of carnage bringing the world’s opprobrium on Israel would be a public relations victory enabled by a willing media. It appears that the latter scenario has been achieved in blood by Hamas and its supporters. Given this scenario, which media covered events in a fair way and which jumped on the bandwagon of condemnation? For weeks, the Gaza border protests, despite evidence to the contrary, were framed as peaceful demonstrations in the image of icons such as Gandhi and Martin Luther King. But the protests appeared to have a more violent edge than in previous weeks. Some young men brought knives and fence cutters. At a gathering point east of Gaza City, organizers urged protesters over loudspeakers to burst through the fence, telling them Israeli soldiers were fleeing their positions, even as they were reinforcing them. . . .
Two other young men carried large knives and said they wanted to kill Jews on the other side of the fence. . . . The vast majority of demonstrators were unarmed, but near a parking area, a man pulled out an AK-47 and took aim at an Israeli drone dropping leaflets. He let off a stream of bullets into the air and brought it down. Later, more gunfire was heard as Palestinian factions argued over who would keep the downed drown [sic], onlookers said. It is inexcusable for soldiers of a military, especially those under democratic civilian control, to shoot and kill protesters, almost all of whom were unarmed, and who pose no credible threat. Yet at the boundary between Gaza and Israel today Israeli soldiers seem to have done just that. It should make Israelis quail that demonstrators were sprayed with live ammunition with apparent impunity. There were dozens of deaths and hundreds of maimings among the Palestinians who had marched to the border to make a point about their right to return to their ancestral homes. Israel’s army evinced no shame in committing what looks like a war crime. And The Guardian didn’t even mention Hamas once in its editorial. How is it even possible to comment on these events without even a reference to Gaza’s terrorist rulers? 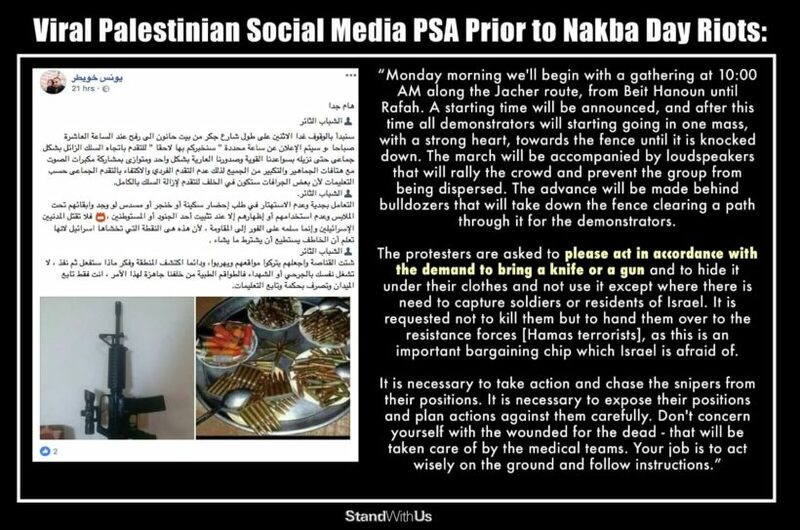 No mention of the terrorist organization that has hijacked the Palestinian protests for its own ends? The loss of life is appalling, but Israeli soldiers found themselves trying to prevent thousands of demonstrators from breaking through the border, egged on by Hamas. Had they got through, there could have been even greater carnage. But, by its very nature, this would threaten the very existence of the state of Israel. Therefore the security forces feel that, however savage the consequences, they cannot allow thousands of protesters in a human wave to cross the border and squat in Israel. Second, although most of the demonstrators are unarmed, some definitely were. Hamas’s cynical eagerness to exploit the discontent means that there are bound to be hardened terrorists in the crowd, carrying knives, guns, petrol bombs or even rocket launchers. There is a prohibition for Hamas operatives to approach the border, from a fear that they will be killed or captured by IDF troops, unless the security fence falls and then they must enter, armed, into Israel under the cover of the masses and carry out terror attacks. That Palestinian children were killed and injured in yesterday’s violence is both shocking and tragic. (AP quoted Hamas-affiliated Gaza health officials that six of the Palestinians killed by gunshots were minors.) That a baby is also among the dead, as a result of tear gas inhalation, is profoundly upsetting. UPDATE: A Gazan doctor told the Associated Press that the baby had a preexisting medical condition and that he did not believe her death was caused by tear gas. The media, however, failed to ask why Palestinian children were encouraged to attend an event that was inevitably going to end in violence and a risk to life. For Hamas, the sacrifice of children is a bonus. 1. Consider the headlines, news reports and stories you have seen and read. 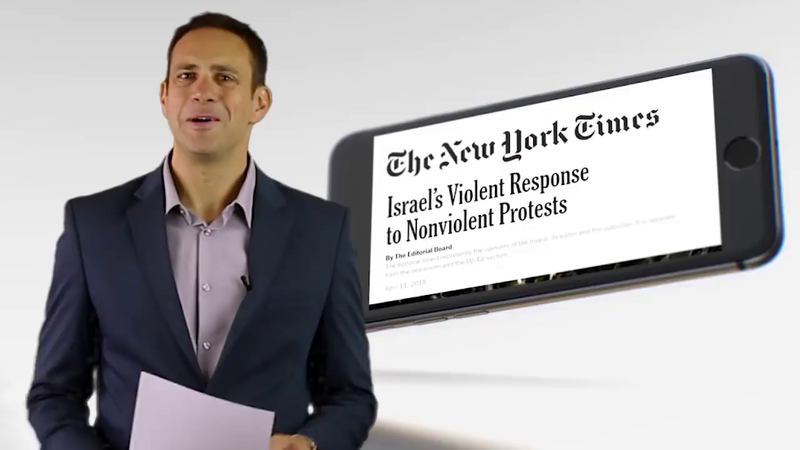 Overall, is the reporting even-handed, or supportive of the Palestinians, or of Israel? 2. Do you think the media overall has a bias against Israel? Explain your answer. This week, both questions are opinion questions. Answers vary.